Fortunately, the days whenTo leave the school without a hat and proudly go to the house without a headdress was considered a feat. But when you walk down the street without a hat and feel at least a fool, this indicates that the adolescent period is over and you have an adult life. But unfortunately, most girls have sympathy forThe headdress is not added, because we all know that in winter, hair is often fatter, and any hair, even if you spent on it a bottle of varnish, will still hold only until you remove the hat. That's why today we'll tell you how to improveIts motivation and wear a hat not because it is so necessary, but because it is beautiful and very good for you. So, the subject of our conversation today will be a hat with fur pom-pom. And do not think that such models canWear only children. After all, you also want sometimes to drop all doubts and spend your day carefree! Believe me, a hat with a fur pom-pon will help you create this mood. In addition, it is worth noting that in the winter knittedThe hat will keep the heat perfectly and will not allow you to catch a cold. And this is also an important fact in favor of this wonderful dress. Now as to the acquisition of such a thing. Of course, you can spend several hours or even days to go through a huge number of stores, finally choose a hat to your liking. But, what if you try to make such a hat yourself. Women are knitting ordinary caps, but why not do the same, but with a pompom? Knitting pattern. You can take sketches on the Internet or in some magazine for needlewomen. And, of course, patience! After all, even if you know how to knit a little, the possibility that everything will turn out right away does exist. And if it did not work out, do not get discouraged, because the gods did not burn pots. And, means, and at you all will turn out! The main thing is, believe in your talent, and everything will be fine! One more thing: If you do not want to learn to knit at all or despite all the patience efforts you still do not have, you can make a knitted hat with a fur pom-pon from the ready-made one. To do this, you only need a ready hat and pompon. 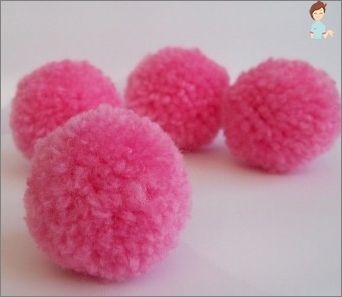 By the way, you can not only buy a pompom, but also sew yourself, if you have a piece of fur somewhere in your house. 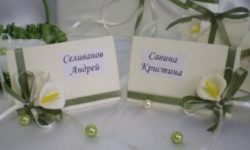 In addition to a small piece of fur, you alsoNeed a chalk, a circular pattern, a marker, a pair of scissors, a needle and threads about the same color as the fur. Now we need to cut out a small piece of fur, from which, in fact, we will do the pompomchik. To do this, unfold the fur upside down and draw a circle around the chalk. The size of the pompon must be determined independently. After you have decided on the size and rounded it, carefully cut out a circle of fur. Attention! Do not leave a few centimeters to the allowance, in this case, we will not need it. Now take the thread and stitch the edges of ourThe future pomponchik. After the first and last stitch were as close as possible, carefully, so as not to tear the thread, we tighten the edges. So our pompomich turned out. In no event should you leave the pompon hollow. To fill it, you can use a small piece of cotton, a little foam or sintepon. After the filler has taken its legalPlace, carefully sew the bottom. Take care that pieces of cotton wool or sintepon do not stick out - it's ugly. Moreover, through such a hole all the filler will very quickly come out, and the hat will need to be altered. After our pompomchik is ready, we sew it to the cap. So our headdress is ready! 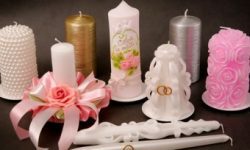 If you are all right with the needlework, youYou can tie the entire cap completely, choosing not only the color and quality of the product, but also the pattern on the headdress. But before you start creating another masterpiece, you need to thoroughly study what kind of headgear is in fashion today. Today the palm tree of the championship belongs by rightHat with earflaps. 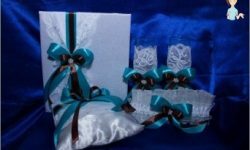 This stunning headdress not only allows you to impress people around with interesting design, but also keeps your ears warm, thus saving you from a huge number of problems. Another nice bonus of such a product can be considered the fact that the pompom can be sewn not only to the upper part, but also to the tips of elongated ears. On the second revenge on popularity - a winter hat withFur pom-pom in retrostyle. To her it is possible to take a beret and a cap. In general, you can choose any style, but remember that a woman's hat with fur pompoms should first of all emphasize your personality, highlighting all your advantages. And only then it is worth paying a tribute to fashion. After all, if a thing sits on you horribly, then what difference is it fashionable or not. Now as for the choice of color. If you want to draw attention to your extraordinary appearance, then you should choose pink. The pom-pon in this case is best done from fox fur. Such a cap will look rather expensive, and a gentle pink color will perfectly shade your face, giving it some softness and expressiveness. Attention! If you prefer sports style, then it is not necessary to use an openwork pattern when knitting, as it will not in principle be combined with your image. In this case, the ideal option will be a fine mating, but the pink tint of threads can be left unchanged. 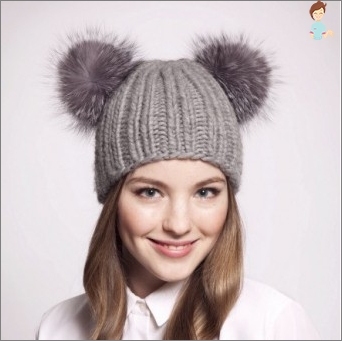 As we have already said, the first time afterAppearance of such hats, knit them exclusively for children. So, if you are already a young mommy and want to please your baby with something new in the wardrobe, you can also tie him up with an excellent headdress. Attention! Be sure to match the look and color of the cap with your child, you do not want all your knitting lying somewhere on the shelf, because your baby does not in any way wear it. And do not think that the children do not understand anything. What is their knowledge in computers only worth. And we at their age in the yards played catch-up! So, with the opinion of the child, it is necessary to reckon, in the end, to wear it to him, and not you! If you have a small daughter, you need a preferenceGive a pink or purple hues. At the same time, you, along with the baby, can also come up with some interesting appliqué that can be sewn from the side. Attention! Do not make the application too large, because in combination with the pom-person, it will make the cap too spattered. By the way, you can make a hat and black, but at the same time you can sew a certain ornament with the help of beautiful and bright beads. Color does not matter, the main thing is that they contrast with the color of the product itself. But for a boy the helmet-cap withFur pom-poms. The essential difference between this type of cap and the others is the continuation of the neck. Roughly speaking, if you decide to knit such a helmet, you will need to tie the place where the child has a little face. Such a cap is very useful. Firstly, you can not worry that your baby will catch a cold on his neck. And secondly, a similar cap can be stylized to a real helmet from some cartoon. The main thing is to be patient and include 100% fantasy. And, of course, before embarking on stylization, you should ask in detail which hero he most liked. And then the delight of your baby will have no limit. 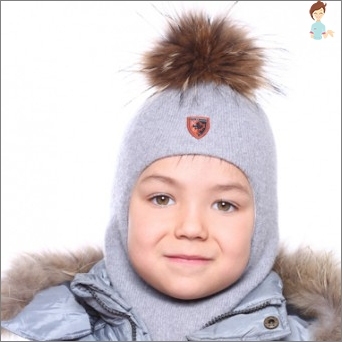 As you can see, knitted winter hats with pomponsAre popular not only in children, but also in the adult world. The main thing is to choose the right style and color. And remember that even if you are a little over thirty, but the soul is really asking for such a hat, then you can not deny yourself. This is harmful to health! And what others think will not bother you, it's your life! Good luck!